nForeign guest nights (FGN) are recorded directly from individual hotel establishments, which indicate the actual number of nights spent in a particular hotel by foreigners. nGraded establishments are categorized by the Sri Lanka Tourist Development Authority (SLTDA) as conventional star-class hotels and boutique hotels. nSupplementary establishments are the smaller guest houses and homestay units (the so-called ‘informal’ sector), which are registered with the SLTDA. nInformal establishments are the smaller units (the so- called ‘real informal’ sector), which are ‘not’ registered with the SLTDA. The total number of tourists as recorded by the Emigration Department and published by the SLTDA for 2016 was 2,050,832. The FGN in star-class conventional hotels for 2016 was 1,595,118, according to the SLTDA and the average stay per tourist in the country is 10.2 days. Hence, by dividing the FGN by the average stay, the total number of tourists staying in conventional hotels is derived. This reveals that the ‘real’ number of tourists staying in graded (conventional) hotels is 1,025,416, which is only about 50 percent of total arrivals. The total FGN generated by the supplementary sector for 2016 was 5,404,602. 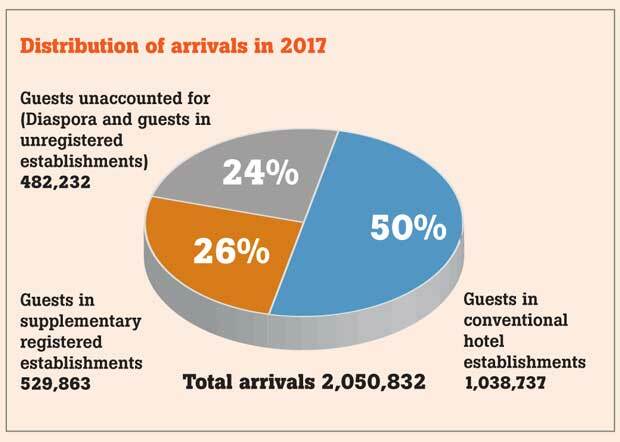 As before, dividing this by the average stay of 10.2 indicates that some 529,863 tourists stayed in these supplementary establishments, which is 26 percent of all arrivals. The balance 24 percent is the unaccounted ‘leakage factor’. This leakage could be some ‘tourists’, who do not stay in hotels, such as the diaspora element. The other part of this ‘leakage’ is the tourists who stay in the real unregistered informal sector. These are the large number of unregistered small ‘bed and breakfast’ units that have sprung up in all popular tourist cities on the ‘round trip circuit’, whose statistics are not caught up in the SLTDA records. nOf the total tourist arrivals for 2016 (2,050,832) only 50 percent (1,038,737) stayed in conventional hotels, while 26 percent (529,863) stayed in supplementary (registered) accommodation. nHence, the total number of tourists staying in all the SLTDA-registered establishments was only 76 percent (1,568,600). nAbout 24 percent (482,232) of tourists are thus ‘unaccounted’ for because they are staying in the unregistered informal establishments. This could be the reason that the graded star-class hotels continue to struggle to maintain high occupancy levels and yields, in spite of the overall arrival numbers showing large increases. In discussing this with several other industry colleagues, the general consensus was that due to possible estimations in some of the STDA figures, the actual number patronizing conventional hotels could be even less than 50 percent.